The easy-to-use ScanSnap N1800 is the first network scanner to offer cloud linking functions as well as enabling users to email, save and print scanned documents through a network. With an intuitive touchscreen complete with GUI keyboard, the N1800 is efficient, secure and intelligent, thereby minimising operator involvement before, during and after the scanning process. The N1800 scanner introduces a network imaging scanner designed to speedily digitise documents and facilitate the paperwork of everyone in the office whether directly into a companies business processes, local network or into the cloud. Directly link the ScanSnap N1800 to a network and digitize documents into processed data for e-mails, faxes, network storage and much more– all with remarkable ease in a compact footprint and with intelligent functions to minimise operator involvement. - Save directly to a network folder. Improve information sharing within the company. - Attach to an e-mail and send to many people quickly at one time. 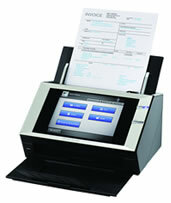 Advanced automated functions ensure the N1800 digitizes your documents with remarkable precision and efficiency. - Send to a network colour printer. ScanSnap can be used as an alternative to colour copiers. - Save directly to a SharePoint folder or to a cloud service like Google Docs and Salesforce CRM for speedy information sharing and management. The N1800 features a large, vibrant touch panel, which utilizes ‘One Push’ interface, so anyone can operate the imaging device with ease. EncryptionScanned data is encrypted and temporarily stored in the scanner while it is being processed for e-mail, faxing, printing or storage. Even if an unauthorised party analyzes the internal memory, they would not be able to decipher the data. Scanned image data deletion The N1800 automatically deletes image data from its internal memory after the processed data is sent to an e-mail, fax, printer or a network folder, Even if an error results in data remaining in the memory, the data is automatically erased the next time the scanner is started up. The N1800 satisfies the digitizing needs of small networks that use a file server and e-mail server. It’s also right at home with more complex LDAP/LDAPS authentication-based networks, integrated with Microsoft Exchange Server, SharePoint and other application hubs. An SDK is available for the N1800 to develop applications (called Add-ins) and to expand the device’s functions to meet the needs of your business. *The SDK (software development kit) allows for the development of scanner controlled workplace applications. The N1800 SDK is free to download. Support is provided for a fee. The N1800 offers ‘Central Administration’ and ‘Job ‘ functions that allow you to collectively configure and manage a vast network of N1800 units with ease from a single console.